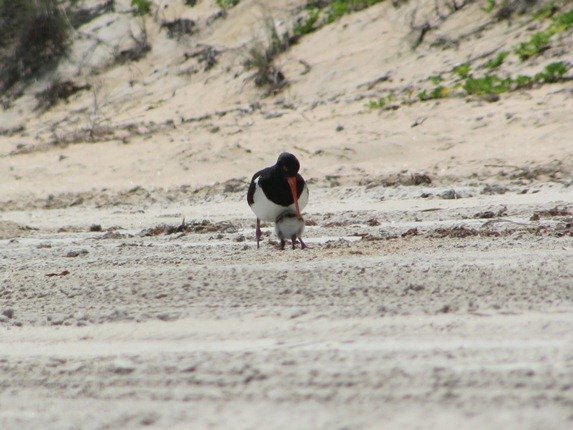 It has been twelve weeks now since the first pair of Pied Oystercatchers attempted to breed along the stretch of beach that we survey and as with each year there have been setbacks. In theory the eggs are laid, the adults share the incubation of the eggs for 28 days and then fluffy chicks emerge. The chicks are then fed and encouraged to feed themselves and after approximately 35 days they are able to fly and escape danger. If only it was that easy! All of our pairs have had to lay a second clutch of eggs this year and the first pair to lay have finally got a chick that will possibly make it….we can’t rule out predation yet, so we take each day as it comes…but we are hopeful this time. 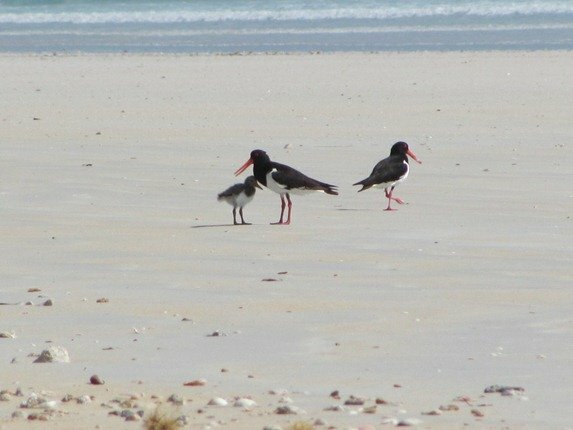 This particular pair of Pied Oystercatchers first arrived on Cable Beach in 2007 to claim a territory. 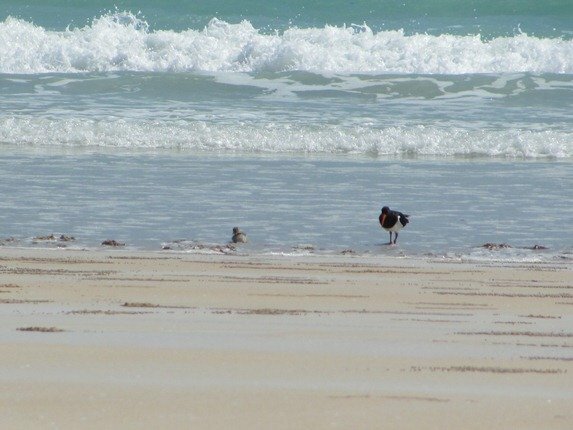 There was a long stretch of beach that did not have a breeding pair, but it was in amongst the vehicles and nudists that frequent the area at this time of year. 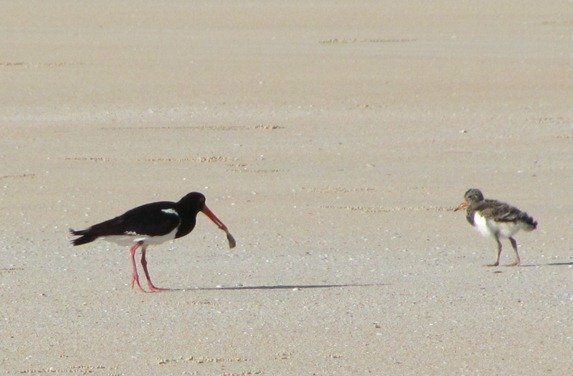 Why would Pied Oystercatchers been keen to use an area with all this activity? 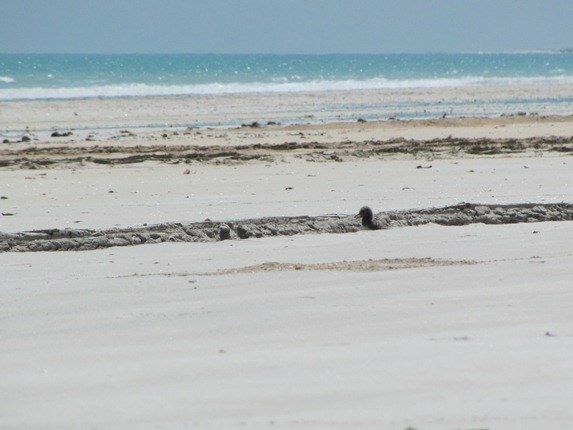 Well, basically it is a good area for putting a nest as there is ample food nearby and the dunes offer protection and good views of incoming predators. 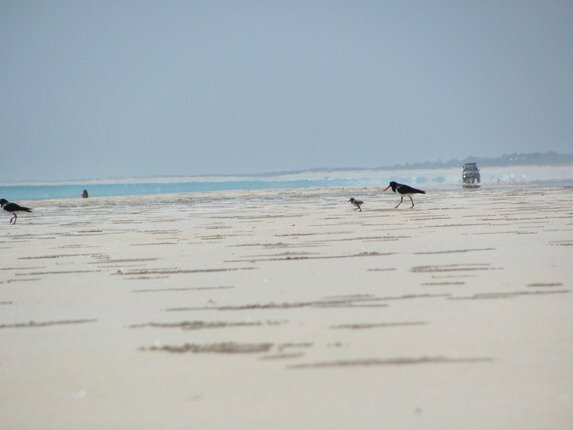 There are other pairs that nest in rather obscure areas, but as soon as the eggs hatch they walk the chicks several kilometres to a better feeding area. 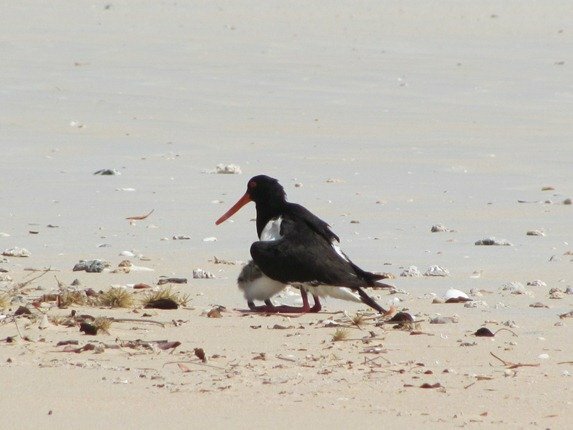 Nesting areas within three to four kilometres of good feeding areas appear to be quite acceptable to the Pied Oystercatchers here. No eggs were laid in 2007, but in 2008 they laid their first two eggs and after three days they did not seem at all interested in sitting on them. The eggs remained there for the whole season and we presume that they were young and inexperienced. 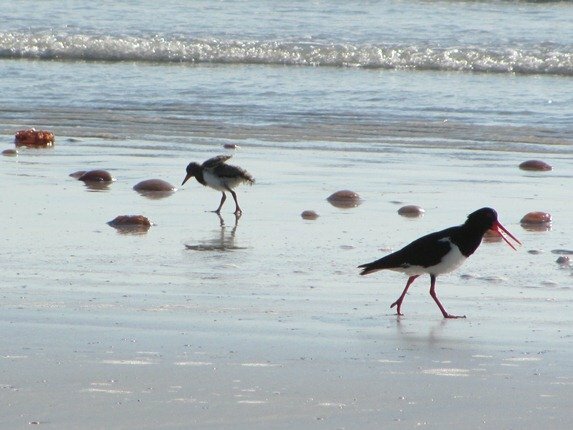 In 2009 they laid two clutches of two eggs, but they were all predated. In 2010 they also laid two clutches of two eggs and the second clutch did hatch, but the chicks were then predated. 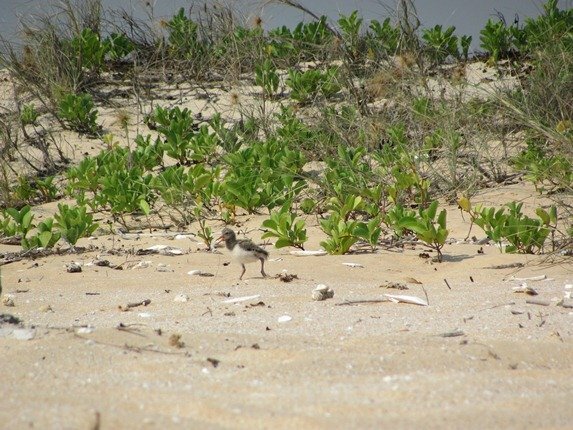 Last year once again they laid two clutches of two eggs each and all of the eggs hatched, but all chicks were predated. 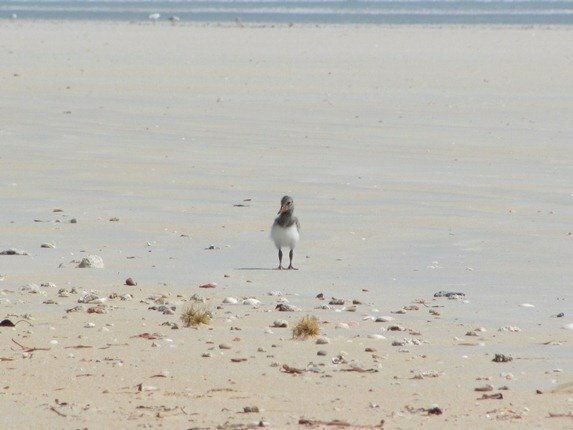 This year they have laid two clutches of two eggs once again and walked the surviving chick north. It is now four weeks old and has been learning about large tides, keeping still when warned by your parents and it is now communicating with bobbing head movements and vocally. Now it just needs to get the strength and feather production complete on its wings and it can fly from danger. 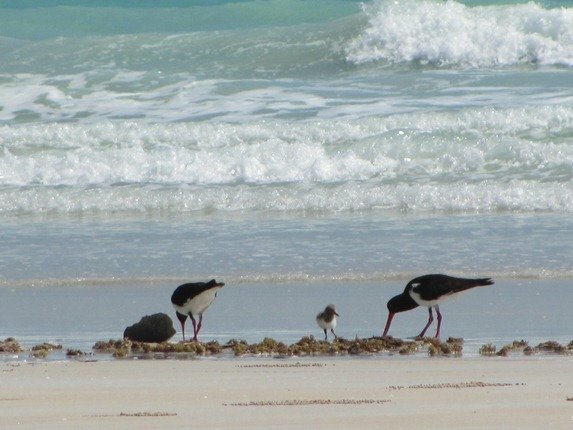 Here are some of the experiences of the Pied Oystercatcher chick on Cable Beach in the last 4 weeks. 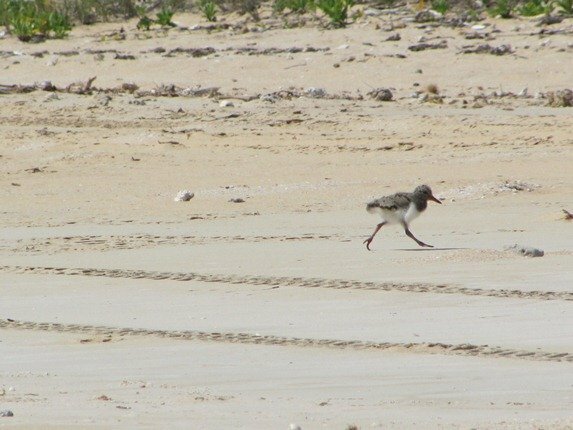 Pied Oystercatcher chick finds out about getting dumped by waves! 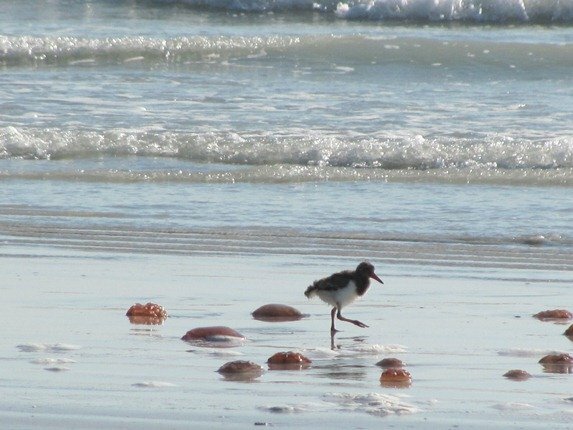 As you can see, there has been a lot of development over the past four weeks and the jellyfish I mentioned last week continue to plague our shores. 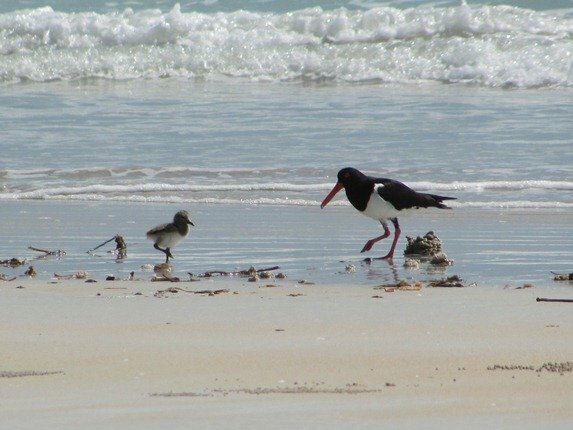 They are drying out as they come ashore and the Pied Oystercatchers are not at all interested in them. There’s a lot more feeding and growth to do before this precious bird is safe from predators, but I thought you might like to see the progress so far. We have a camping and birding trip planned for next week without a computer, so if I don’t respond to your comments there’s good reason! It’s beautiful to see this whole sequence of the chick’s growth and learning! Fingers crossed this one continues to thrive and survive. Love this, especially the shot of the chick tucked into the parent’s wing. Thank you so much for sharing these, Clare! @ Wendy and Meredith-thanks-just hope it flies soon and will then be so much safer! 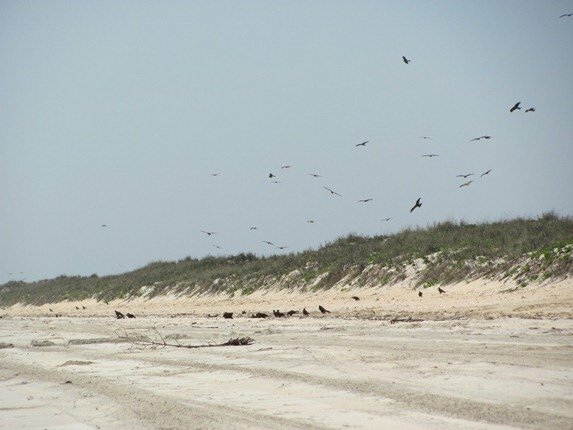 I always thought a flock of Black Kites was a joyous thing to find. Well, not everywhere and for everyone, right? Just to update you all….this chick can fly! 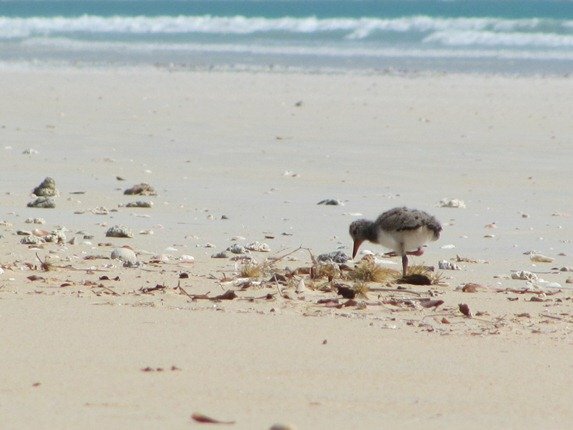 It is still with its parents & will be for some time yet, as they can dig deeper for better food, but there’s no reason for this little bird to not live another 20 or more years!